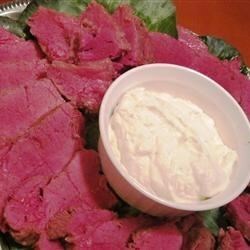 "This is a basic corned beef roast recipe. It is easy to prepare and wonderful to eat." Place the brisket in the center of a roasting pan. Arrange the potatoes and carrots around the sides. Place the onion and garlic on top of the roast, and season with salt and pepper. Empty the seasoning packet over the roast, and pour enough water into the pan to almost cover the potatoes. Cover with a lid or heavy aluminum foil. Roast for 5 to 6 hours in the preheated oven, until the roast is so tender it can be flaked apart with a fork. I did this recipe in the slow cooker instead and did not add the salt. It turned out fantastic! My family love it! Very good, alot easier than boiling, however the secret to the salt issue. When cooking corned beef ALWAYS wash in cold water before cooking. This gets a lot of the salt out. This was good, great alternative to boiling the corned beef. I'll do this again! Awsome recipe but salt shouldn't be used in it, was too salty, otherwise was easy to prepare. Delicious. Thank you. Tried this but it is too salty and we only ate a few mouthsful. I think you need to cover the meet with liquid to pull out the excess salt. I didn't add any salt and this was a fabulous corned beef. Much better than boiling it.